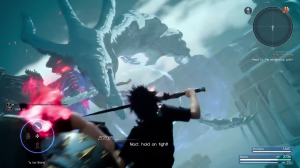 This page contains a detailed walkthrough of Chapter 9 – Callings in Final Fantasy XV, including quests, objectives, items, enemies and bosses encountered in the game. 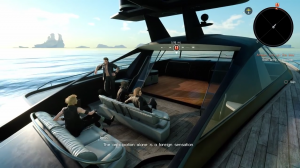 You will travel via ship to Altissia and there will be a conversation between Noctis and his friends during the trip. Once the group arrives at Altissia, they have to gain entry to Accordo. You have to pass through the gatekeeper, but he will ask a question before you proceed. If you choose “Leave it to Cid”, he gives you money after talking to the gatekeeper. If you choose the other choice, then you will not receive any money. Proceed to search for Weskham’s bar called the Maagho. Once you’ve arrived at Maagho, you will be greeted by Weskham at the counter. You can ask him questions relating to your mission (Ask about the empire, Ask about the Oracle, Ask about Leviathan, That’s all). Choose “That’s all” if you want to proceed to the next scene immediately. After the conversation, Camelia Claustra, First secretary of the Accordo Protectorate, will arrive. Camelia mentions that Lunafreya is in their care. Camelia will offer Noctis to come to her estate to talk about meeting Lunafreya. Head to the Leville to book a stay at the hotel, then proceed to the first secretary’s estate. When you arrive at the estate, you need to talk to Camelia in a kingly manner in order to win her trust and cooperation. Pick the first choice among the set of choices for the best possible outcome. 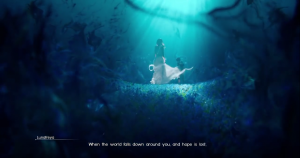 Before the quest begins, their will be a long cutscene involving Lunafreya summoning Leviathan. However, their will be empire soldiers standing in the way, Noctis needs to defeat these soldiers in the hallway for the summoning to be completed. Noctis will be alone for the entire battle, so be careful of your moves and plan your attacks well against the soldiers. After the battle with the soldiers, a cutscene will commence. Wait for the cutscene to finish, and then leap when you arrive at the vantage point. 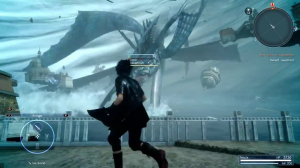 Prompto is there to pick you up with a flying vehicle, however, Leviathan will attack you. Press the square button to block Leviathan’s attacks and then press the circle button to parry the attacks. The quest will be completed after the quick-time event. 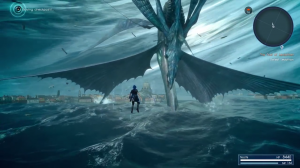 At the start of the quest, you are near the eye of Leviathan, there are choices as to what you will say to the Hydraean (Request her power, Demand her power). Choose “Request her power” for the right outcome. After making a choice, defeat Leviathan. Teleport to pieces of buildings where Leviathan will be using point warp. Use this ability repeatedly in order to attack Leviathan using warp-strike. The second half begins after a cutscene. 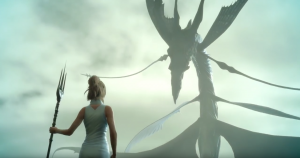 Now that you have Lunafreya’s trident, you can use it to deal massive damage against Leviathan. You are also able to fly to navigate through the area much easier, unlike last time where you have to use point warp, making the battle difficult. 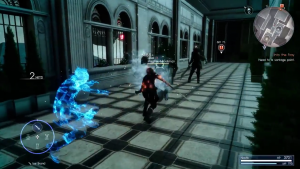 The second half is a fairly easy fight because Noctis can use the Armiger arsenal infinitely. After the battle, watch the cutscene. Also, requesting her power does make her a little bit weaker in her attacks, but you miss out on extra AP. If you ‘Leave it to Cid’ in the first quest, he reimburses himself from your Gil to bribe the gatekeeper. He doesn’t give you money, he takes it away from you.